Version: 2013 revised edition, square box as per pic. Game: Very good. Game is punched, complete and looks like it was never played. No insert. Box: Good. 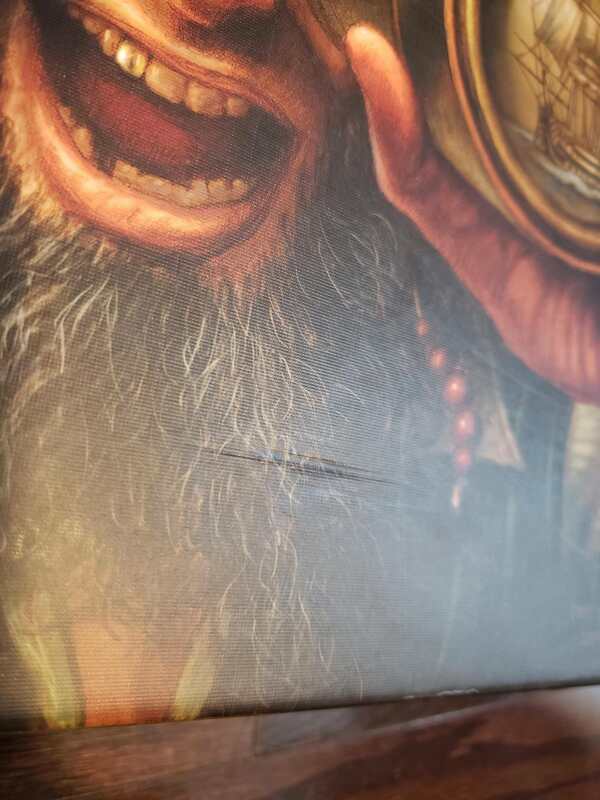 Noticeable corner wear, especially one corner where part of the box art/paper has worn off. Some shelf wear as well. Will post photo by Monday evening since this is the second time I've edited box condition. Edit: Updated box condition again. Photos added for worn front box corner and back box corner. Also photos for box front and back added. GAME NO LONGER AVAILABLE Was Neanderthal Version: Sierra Madre Games, 1st edition, 2015 printing as per pic. Game: Like new. Complete and never played, cards still sealed. Box: Like new. Minimal wear. Edit: Game removed from my trade list, at least for now. Box: there is no box Content: New, still unpunched +altname+ Item no longer available -altname- Note: this item no longer available. An empty want list will be submitted. Also note .... I can't seem to change this to "Outside the Scope of BGG". Box: Acceptable/Good condition. Box is a bit worn and has been taped up. Contents: Like New. All cards included and in excellent condition. 285 cards, mostly from 2013, 2014, Gatecrash, and Return to Ravinca. 104 basic land, 22 colourless/multi-colour, 41 Red, 30 Green, 32 Black, 22 Blue, 34 White Best cards (based on pricechecks) seem to be: Izzet Charm, Thundermaw Hellkite, and Manaweft Sliver Cards in very good condition, a bit of play wear here & there. Comes in a Magic-branded box, which is in decent shape, but some shelf wear. First edition (Z-Man), English, with "upgrade pack" (to make it compatible with the expansion). Includes "Pandemic: On the Brink (2009) rating=8.08 " expansion. Played several times, but in "Very Good" shape. "Bio-terrorist" pad is unused. Everything is currently in the main game box, but the expansion box will be provided. If there was an insert in the main game, it's long gone. "Adel Verpflichtet" (early version of "Hoity Toity", only plays 5, not 6). Avalon Hill, English 1991 edition, with SdJ 1990 logo. Box is in very good shape, some shelf wear, but no structural damage. Contents in very good condition. CSE Games English Kickstarter edition. Opened & played a couple of times. Very good condition. Box is structurally in very good condition. It has some very light water damage on the back (see below). Edit - added picture, clarified box condition. New, Sealed. Sunrise Tornado Games, English Kickstarter edition, with all expansions. Version: 2018 Kickstarter edition. Game: Insert is missing. Base game is stored in the game box along with the expansion. Box: Excellent Sweetener: "Root: The Riverfolk Expansion (2018) rating=8.46 " - no box, everything stored in the original game box. Components are otherwise like new. Version: English first edition. Game: Excellent, all cards sleeved. Box: Excellent. Version: First edition. Game: Excellent Box: Decent amount of shelf wear. Otherwise box is intact. Version: 2004 First edition Game: Excellent Box: Corner split, some shelf wear. Version: 2017 Second edition. Game: Excellent, insert missing, all cards sleeved. Box: Excellent Sweetener: "Vast: The Fearsome Foes (2018) rating=7.81 " - Insert missing, all card sleeved. Box: Very Good Contents: Very Good Version: English Edition Comments: Played only once Sweetener: "Scrabble Slam! (2008) rank=16216 rating=5.12 " Box: Very Good Contents: Very Good Version: English Edition Comments: Played a couple times. Version: English First Edition Box: Very Good but insert has been thrown out as the cards would not fit when they have been all sleeved Contents: Very Good (ALL cards have been sleeved and bagged) Comments: Played twice. No longer available New and Like New. Base game and the first three modules played once. All the rest punched but unplayed. (One of two copies). New in shrink. New. Opened but never played. no longer available Very good condition. First Edition. New Kickstarter Edition. Opened but never played. 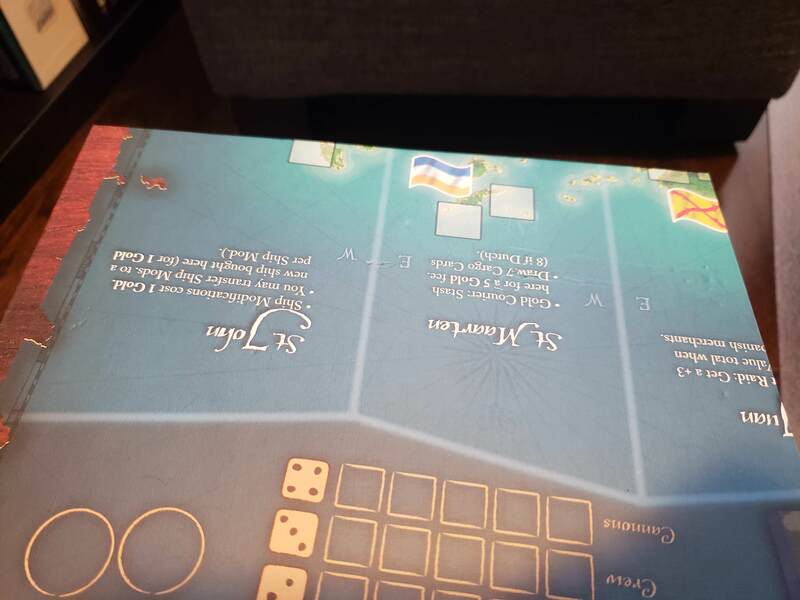 Version: English-only edition (2018), Language: English, Publisher: Deep Water Games Like new (played once) SWEETENER: "Captive (2016) rank=3368 rating=7.42 "
WOTC English Edition Box: Good Condition Components: Good Condition - board has slight warping from humidity difference that I've seen in most copies of the game I've played. Edition: Days of Wonder 2013 English Box condition: Good Components: Complete and Good other than one plastic skull idol was off its gray base when I traded for it. Could be glued, I didn't get to it yet - still fully usable. Very good condition. One guy missing an arm. 10th Anniversary Multilingual Edition Box: Good Condition for an Alea box Contents: Very Good Condition Note: The Ravensburger/Alea boxes are on the thin side, and like many, this one is slightly bowed at a corner of the front cover. First/English base game, 2017 Deluxe Ed. Expansion Everything very good condition - only played three times. Sweeteners: Tiny Epic Galaxies: Beyond the Black English DELUXE Edition Expansion - like new Tiny Epic Galaxies: Beyond the Black Drones Mini Expansion - New in original ziplock "Tiny Epic Galaxies: Beyond the Black (2017) rating=7.89 " "Tiny Epic Galaxies: Beyond The Black – Drones Mini Expansion (2017) rating=7.2 "
Very good condition. French edition (2014), Language: French, Publisher: IELLO VersionID: 226649 Includes and a nice colour copy of the English rules. The game itself is language independent. Sweetener: The Ambassadors expansion "Madeira: The Ambassadors (2014) rating=7.59 "
Brand New Sweetener: Brand New: In Shrink "Killer Bunnies and the Journey to Jupiter (2008) rank=14717 rating=5.65 "
Box: Very Good Components: Excellent Edition: English 2012 Edition w/ Rivers Language: English May be slight wear from moving around, used very minimally though, all components in excellent shape. Box: Very Good Components: Very Good Edition: Fantasy Flight English 3rd Edition (2011) Language: English Please note that this is 3rd Edition of the Fantasy Flight release, not the new 2017 reprint that is formally called the Second Edition. Contents and box are all in very good condition. Contents have been bagged, though the original insert is still within the box. Box: Good / Very Good Components: Good / Very Good Edition: English Edition Language: English Contents and box are all in very good condition. Box: Very Good / Excellent Components: Very Good / Excellent Edition: Kickstarter Edition Language: English Kickstarter game that was recently delivered. Opened, punched, put nicely in its tray, but never been used. Game is not yet retail available. Box: Very Good / Excellent Components: Very Good / Excellent Edition: English Edition 2015 Language: English Sweetner: "Lanterns: The Harvest Festival (2015) rank=597 rating=6.98 (Lanterns: The Emperor's Gifts)" Components are all in great condition, no obvious whitening on any corners or damage to the box. Expansion is included in the box with the base game. Expansion box and base game cardboard insert are discarded, all contents bagged up. Box: Good / Very Good Components: Good / Very Good Edition: English Edition Language: English Contents and box are all in very good condition, no visible issues that I've noticed. Original insert still within the box. English 2nd Edition Box and components are both brand new. Shrink wrap has been removed but the game has never been played. Nothing is punched, none of the cards are unwrapped. Comment (added Fri, 23 Nov 2018 18:01:07 +0000): Yes, didn’t respond here, but I edited description to show publication date. English first edition. Played once. Box and components are in like new condition Sweeteners: "Unknown (2016) rank=4700 rating=7.73 " English first edition. Played twice. Box and components are in like new condition. "Star Realms (2014) rank=87 rating=7.62 " Box is in good condition. Lots of whitening. Cards have only been played once, very good/like new condition. All are Brand New: 2013 Edition - 1st English Edition, 5th Printing Sweeteners: "Munchkin Cthulhu 3: The Unspeakable Vault (2008) rating=6.57 " "Munchkin Cthulhu 4: Crazed Caverns (2010) rating=6.72 "
no longer available Kickstarter Special Edition with Larger box, expansion and many promos; plus dividers for the expansion and each promo, all in one box Very Good Condition Sweeteners: Fleet: Arctic Bounty (2014), Fleet: Inuit Fisherman (2012), Fleet: Mini Expansion Pack (2012), Fleet: Nunavut Weather Authority (2012), Fleet: Salty Captains (2012), Fleet: Wharfside Casino (2012) "Fleet: Arctic Bounty (2014) rating=7.66 " "Fleet: Inuit Fisherman (2012) rating=7.24 " "Fleet: Mini Expansion Pack (2012) rating=7.3 " "Fleet: Nunavut Weather Authority (2012) rating=6.55 " "Fleet: Salty Captains (2012) rating=7.27 " "Fleet: Wharfside Casino (2012) rating=6.84 "
Box: Like new Condition: Like New - Opened and unplayed! All components still in punchboard. Basically brand new but does not include the KOT promo card. Very good condition. All cards sleeved with KMC Perfect Size sleeves. 2 stickers used. 1 other sticker was damaged in the box. Remaining sticker sheets intact. Sweeteners: Dragonfire: Character Pack – Heroes of the Sword Coast (2017), Dragonfire: Adventures – Shadows Over Dragonspear Castle (2017), Dragonfire: Wondrous Treasures (2017) No original packaging for expansions. All contained in core set box. "Dragonfire: Character Pack – Heroes of the Sword Coast (2017) rating=7.89 " "Dragonfire: Adventures – Shadows Over Dragonspear Castle (2017) rating=7.56 " "Dragonfire: Wondrous Treasures (2017) rating=7.63 "
The description for this item exceeds 2000 bytes (2506). Click in this box to display it. Item condition: Very good. Opened but cards are sealed Box condition: Good. Corner squished a tiny. Item condition: new in shrink Box condition: New Edition: Kickstarter Deluxe Sweetener: Will include 3d printed insert to hold all the components. Version: English Edition Box: Very Good Contents: Very Good Comments: No visible wear on box or contents and only played once. First Edition Languages: English IMPORTANT: Base box minis have been painted by a 1st time painter (they're find but won't win any awards.) Also comes with several expansion minis, they have been primed but not painted. Other components are all in very good condition. Box is just the plain cardboard box that it came in. English edition. Opened played a few times. Box has minor shelf wear. Components like new. Opened played a few times. Box has minor shelf wear. Components like new. +altname+ Bottom of the 9th Bundle -altname- Box condition: Very good Content condition: Very good Version: English first edition (2015) Publisher: Greater Than Games (Dice Hate Me Games) Sweeteners: Condition of the below cards is very good. Does not include foil wrapper for the packs and all cards are stored in a black Ultra-Pro deck box. "Bottom of the 9th: Big League Support (2015) rating=7.23 " "Bottom of the 9th: Hitters Pack (2017) rating=7.45 " "Bottom of the 9th: Pitchers Pack (2017) rating=7.5 " "Bottom of the 9th: Season 1 Promo Pack (2015) rating=7.27 "
+altname+ Star Realms Bundle -altname- Box condition: Worn Content condition: Very good (cards were sleeved, sleeves not included) Version: English first edition (2014) Publisher: White Wizard Games Sweeteners: Condition of the below cards is very good. All cards are stored in a BCW 400 count box. Promo Cards: "Star Realms: Starbase Omega Promo Card (2016) rating=7.5 " "Star Realms: Fortress Oblivion Promo Card (2016) rating=7.31 " x4 "Star Realms: Battle Screecher Promo Card (2013) rating=6.92 " x2 "Star Realms: Megahauler Promo Card (2016) rating=7.61 " "Star Realms: Battle Barge Promo Card (2015) rating=7.11 " x4 "Star Realms: Breeding Site Promo Card (2015) rating=7.12 " Expansion Packs: "Star Realms: BGG Store Promo Set One (2014) rating=7.25 " "Star Realms: Promo Set Two (2014) rating=7.12 " "Star Realms: Crisis – Bases & Battleships (2014) rating=7.75 " "Star Realms: Crisis – Fleets & Fortresses (2014) rating=7.75 "
Condition: New in shrink Box: damage to one corner, split about 1.5 cm at the seam. 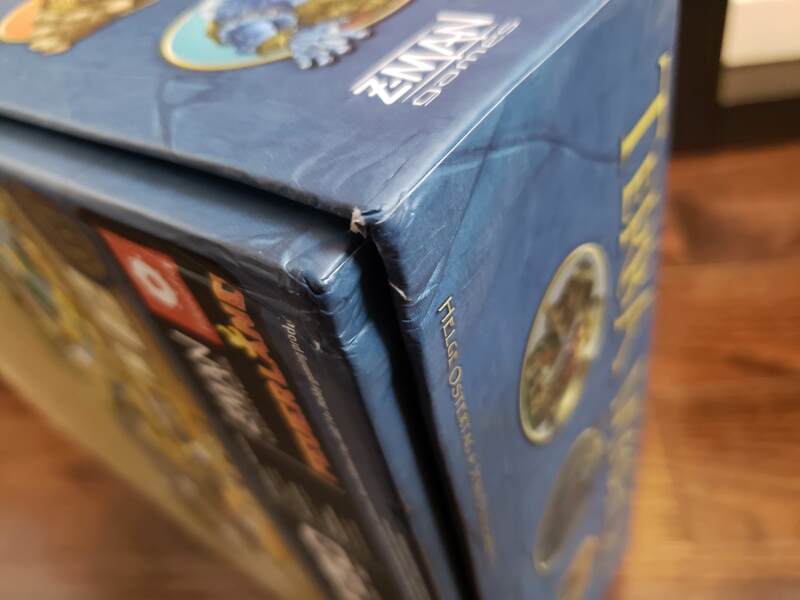 Edition: Retail EDIT for details about box damage On closer inspection, the tear is closer to 3cm and that corner of the box lid is slightly dented. Comment (added Fri, 23 Nov 2018 19:03:45 +0000): Sure! I’ll post it tomorrow because I won’t be home between now and then. cards are very played and a dents in the bullet. Box condition: Never had a box Content condition: New in shrink Version: First edition (2014) Publisher: Looney Labs Note: This is a second copy. Contents: Very Good. Box: Good. Some whitening on bottom and corners. Tiny dent on the bottom side. Version: English first edition (2015) Edit: Updated box condition. You will receive the four colours listed below: - Yellow - Purple - Pink - Frosted Each comes new and sealed. When lying flat, the bowls measure 6" x 6". You will receive the two colours listed below: - Brown - White Each comes new and sealed. When lying flat, the bowls measure 6" x 6". Box : Very Good Contents : Very Good, played once - placed back in original order. Sweetener : "Fog of Love: Promo Card Set (2017) rating=7.23 (Fog of Love: Promo Card Set)", new in shrink. Box - Very Good. Some whitening on corners of box Contents - Very Good, cards show minor play Sweeteners : International Table Top Day 2017 Promo --"FUSE: International Tabletop Day 2017 Promo Card (2017) rating=7.14 (FUSE: International Tabletop Day 2017 Promo Card)"
Promo - like new, never used, sleeved. Sweetener : "7 Wonders Duel: Stonehenge rank=273 rating=6.83 (7 Wonders Duel: Stonehenge)" Promo - like new, never used, sleeved. Box - Very Good Condition Contents - Very Good Condition Cards were sleeved upon opening in the premium love letter sleeves. Comment (added Sat, 24 Nov 2018 11:57:43 +0000): [q="g3p3nk"]Since there's no description, is it safe to say that this is English second edition (2015)? [/q] From what I can see from the BGG version page, there is only one English edition - 2015. Edit: I just checked the product code on the back of the box and it's ELY01, which BGG calls the English Second Edition. New in Shrink. Deluxe edition. New in Shrink. Mayfair 4521. New in Shrink. Kickstarted Deluxe Edition with mat & wooden pieces. Played once, like new. "Unlock! The Island of Doctor Goorse (2017) rank=1715 rating=6.82 " New in Shrink. "Unlock! The Nautilus' Traps (2017) rank=4208 rating=5.94 " New in Shrink. "Unlock! Tombstone Express (2018) rank=3067 rating=6.91 " Played once, like new. "OutLawed! (2017) rank=7769 rating=6.71 " New in Shrink. New in Shrink. Newest, English 10th Anniversary edition (2018). With lot of expansions, all 10th Anniversary edition with the newest updated graphics, all new in shrink, from the recent KickStarter. + Railways of the World: Mini Expansion Bundle (6 colors) "Railways of the World: Event Deck (2011) rating=7.42 " "Railways of Mexico (2010) rating=7.77 " "Railways of North America (2013) rating=7.66 " "Railways of the Western U.S. (2010) rating=7.96 " "Railways of Great Britain (2013) rating=7.88 " "Railways of Europe (2008) rating=8.09 " See kickstarter.com/projects/... etc. Contents: New in shrink. Box: New in shrink. Version: Ravensburger English/French edition (2011) Other: This is a second copy. Contents: New in shrink. Box: New in shrink. Version: English/French edition (2012) Other: This is a second copy. Box condition: Flimsy tuck-box that I replaced with deck box right away Content condition: Very good; Opened, but never played Version: English first edition 2015 Publisher: White Wizard Games NOTE: This is the first Kickstarter edition. This includes first year promo set that comes with the Kickstarter. I stored this in a deck box to keep the cards in good shape, but I should still have the original flimsy box. Note that this will not come in deck box, I will package this in a bag. English base set (with starter decks and two packs) Like new, opened but played once. Excellent Condition Includes "One Night Ultimate Werewolf (2014) rank=288 rating=7.23 " no box, components stored in Ultimate Alien Box. Excellent condition Original Insert Includes; "Legends of the American Frontier: True Grit Expansion (2016) rating=7.31 "
The info below applies to every expansion in the listing, but there are NO BOXES (Picture in description used to help identify which expansions are in the listing) Contents: Good Box: No Boxes Edition/Publisher: Fantasy Flight Games Language: English "Android: Netrunner – What Lies Ahead (2012) rating=8.17 " "Android: Netrunner – Trace Amount (2013) rating=8.16 " "Android: Netrunner – Cyber Exodus (2013) rating=8.19 " "Android: Netrunner – A Study in Static (2013) rating=8.1 " "Android: Netrunner – Humanity's Shadow (2013) rating=8.16 " "Android: Netrunner – Future Proof (2013) rating=8.2 "
Includes: "Star Realms: Colony Wars (2015) rank=156 rating=7.93 " "Star Realms: Cosmic Gambit Set (2015) rating=7.28 " "Star Realms: Crisis – Bases & Battleships (2014) rating=7.75 " "Star Realms: Crisis – Events (2014) rating=7.11 " "Star Realms: Crisis – Fleets & Fortresses (2014) rating=7.75 " "Star Realms: Crisis – Heroes (2014) rating=7.01 " "Star Realms: Gambit Set (2014) rating=7.24 " Edition: English not sure of the version, not the kickstarter Condition: Cards in great shape. The two tuck boxes are worn/bent. The expansion packs don't have the packaging, I'll put them in a cardboard box. Version: English Edition Box: Very Good (Slight dent on corner, see picture) Contents: Very Good (Complete) Sweetener: "Near and Far: Amber Mines (2018) rating=8.39 " Box thrown own and put in the main box. Edition: 8th Summit English Edition Condition: Box in great condition. Components are bagged and in like-new condition. Missing a single yellow Earther mini, it came like that =/ Rule book has some errors in the components list, please see the [filepage=140840]FAQ[/filepage] for the accurate list of components. $3 Cash Delivered on the day of the trade. $5 Cash Delivered on the day of the trade. $10 Cash Delivered on the day of the trade. $15 Cash Delivered on the day of the trade. $20 Cash Delivered on the day of the trade. $25 Cash Delivered on the day of the trade. $30 Cash Delivered on the day of the trade. $35 Cash Delivered on the day of the trade. $40 Cash Delivered on the day of the trade. $45 Cash Delivered on the day of the trade. $50 Cash Delivered on the day of the trade. $55 Cash Delivered on the day of the trade. $60 Cash Delivered on the day of the trade. Version: English Edition Box: In shrink Contents: In shrink Sweetener 1) dark tales: Snow White (in shrink) "Dark Tales: Snow White (2014) rating=6.76 " 2) dark tales: little red riding hood (in shrink) "Dark Tales: Little Red Riding Hood (2015) rating=6.91 "
Version: English Edition Box: Very Good Contents: Very Good (Complete) Sweetners 1) Pocket Battles: orcs vs elves (box and components good conditions) "Pocket Battles: Elves vs. Orcs (2010) rank=2557 rating=6.6 " 2) Pocket Battles: Macedonians vs Persians (box and components good conditions) "Pocket Battles: Macedonians vs. Persians (2012) rank=3325 rating=6.91 " 3) Pocket Battles: Confederacy vs Union (box and components good conditions) "Pocket Battles: Confederacy vs Union (2014) rank=4559 rating=6.95 "
Very good condition. All expansions in good to excellent condition. All original boxes included. Some box wear. Includes: "Super Dungeon Explore: Caverns of Roxor (2012) rating=7.42 (Caverns of Roxor)" "Super Dungeon Explore: Captain R (2013) rating=7.24 (Captain R)" "Super Dungeon Explore: Kaelly the Nether Strider (2014) rating=7.47 (Kaelly the Nether Strider)"
Box shows a bit of fade. Two additional items to note: 1. The rulebook is in good condition but the staple is loose. 2. One of the 95 trade tokens is missing. There are extra blank ones and so gameplay is unaffected. Otherwise contents are in great condition! Received in previous trade, in good condition. Sweeteners: "Legacy: Forbidden Machines (2013) rating=7.62 (Legacy: Forbidden Machines)" "Legacy: Forbidden Machines – Deep Vault (2013) rating=6.9 (Legacy: Forbidden Machines – Deep Vault)" "Legacy: Gears of Time – Kickstarter Backer Promo Card (2012) rating=6.61 (Legacy: Gears of Time – Kickstarter Backer Promo Card)"
English second edition (2013), I believe. In good condition. Complete and in very good condition. Complete and in good condition. Complete and in good condition. German edition pictured. Pictured Mayfair edition New in shrink. Shrink plastic has become brittle and has ripped slightly with age. Excellent Condition, played twice. 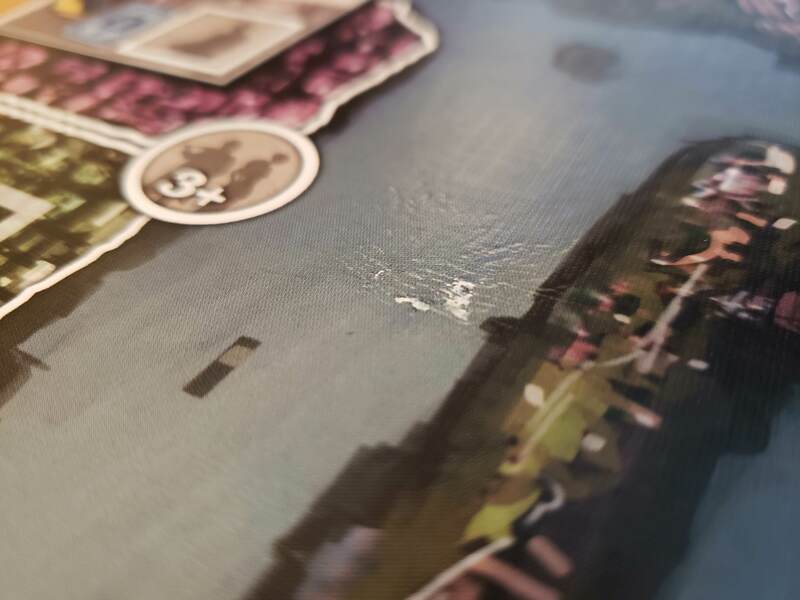 Sweetner: "Lords of Waterdeep: Scoundrels of Skullport (2013) rating=8.22 "
Comes with the Matsuri minis, Matsuri expansions, and sleeved cards. There is some grey smudges on the white box, otherwise game is in good condition. No longer available. It is sold. AEG John D Clair Great condition. Everything complete. Space cowboys Box: Great condition. No visible marks. Contents: complete and great condition . Blue Orange Games Box: Great Condition. Game has been only played twice. Contents: Complete and in excellent condition. TMG Box: Great Condition. Game has been played only 3 times. Content: Complete and in excellent condition. Plan B Games Box: Great condition. No signs of wear. Content: Complete and excellent. CMON Box: Good Condition. Game has never been played. Contents: Unpunched and still in unplayed condition. Fower Games Box: Great condition. Game has been played only once. Contents: Complete and excellent. Eggertspiel Box: Good condition. Minor shelf wear on the edges. Content: Complete and good condition. HUCH! Box: almost brand new. Game has been played once. Contents: complete and excellent. What's your Game Box:Good condition. Very minor self-wear on the corners. Contents: Complete and great condition. Z-man Brand New In Shrink. Kosmos Box: Good Condition. Game has never been played. Almost new. Z-man Games Box: Minor shelf wear on edges Contents: Complete and good condition. Queen Games Brand New in Shrink. This is the much coveted Days Of Wonder Edition of Colosseum. Box is in perfect condition. Everything Complete and in excellent condition. 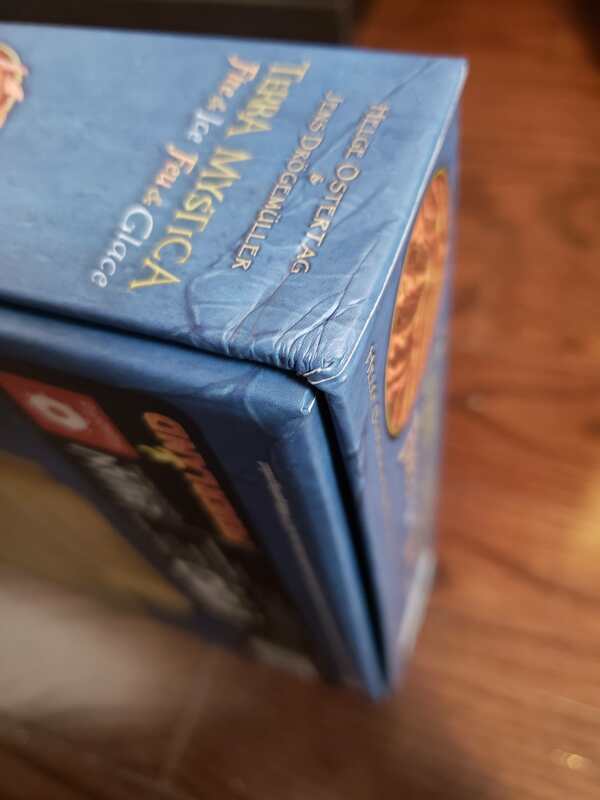 Rio Grande Games Box has some wear on the corners. Everything complete. Contents in great condition. Rio Grande Games Out-of-print 2 player game Everything complete and in good condition. Kickstarter edition (2014) Sweetener: "Robinson Crusoe: Adventure on the Cursed Island – Spyglass of Illusory Hope (2014) rating=6.24 "
box: some minor shelf wear contents: no insert. complete and in great condition. box: some minor shelf wear contents: no insert. Unpunched. Box and contents in good condition. This is the 1st edition. Sweetener: 1st edition "Pandemic: On the Brink (2009) rating=8.08 (Pandemic: On the Brink)" with the bio-terrorist pad unused. Box and contents in good condition. If it makes any difference, this is the 2018 printing. Sweetener: "Morels (2012) rank=610 rating=7.03 (Morels)"
Box and contents in good condition. Some minor box wear. Everything fits in the expansion box, but I'll provide the base game box as well. These are the 2011 English edition. Sweetener: "Kingsburg: To Forge a Realm (2009) rating=7.89 (Kingsburg: To Forge a Realm)"
2008 edition but also includes the 2016 second edition update pack. Some minor box wear and very minor card wear. Sweetener: "Dominion: Seaside (2009) rating=8.05 (Dominion: Seaside)"
Box and contents in good condition. The larger wonder cards don't lie flat. They were that way when I got the game new, and I prefer it because it makes it easier to tuck the smaller cards under them. Shouldn't be hard to flatten them out if that bothers you though. Third edition. Box and contents in good condition. Sweetener: [thing=212760]Evolution: Climate Conversion Kit [/thing]. English Third Edition (2013) Publisher: nglish Edition Publisher: Steve Jackson Games Box Condition: Very Good Condition Components Condition: Very Good Condition Except Missing one food token (Money). Game play unaffected. First edition. Box corner has some wear. Content complete and in excellent condition. Contents: Very good. Complete, and no major sign of wear. Box: Acceptable. No structural damage, but a small place on the front where the printing has scraped off, leaving a white spot. Sweetener: "Blue Moon: The Terrah (2004) rating=7.12 " Expansion deck is New in Shrink and in a separate card deck. Complete in great condition. SWEETENER: Home made copy of Hanabi and No Thanks. Both are made on nice cardstock with sleeves. 3 cases have been played. But all components in great condition. Everything is restored to original places. One case is unopened. All pieces complete and fully replayable as if newly purchased. New, unused. It never came with a shrink/plastic wrap, so don't be alarmed; it's new. Monstrous Box: Like New. Contents: Shrink wrapped. Notes: Opened to read instructions but unplayed. Sweeteners: "Alien Wars (2015) rank=11064 rating=5.77 "
Box: Good. Contents: Good. Notes: Played once or twice only. Box: Good. Contents: Good. Notes: Received in previous math trade and played once or twice.